Professional at-home teeth whitening kits are those obtained from your dentist which contain a high concentration of either hydrogen peroxide or carbamide peroxide. They are slightly more expensive than over-the-counter whitening kits ($100 to $400 compared to $20 to $100, respectively) but are less pricey than the average in-office procedure ($650) & up. Custom-fitted dental trays are included to keep the whitening solution on the surface of the tooth and limit the exposure of the solution to the sensitive gum (gingival) area. Professional in-home kits are relatively easy to use and offer exceptional results after just one to two weeks of use. Professional in-home whitening kits aren't something you can pull off the shelf. 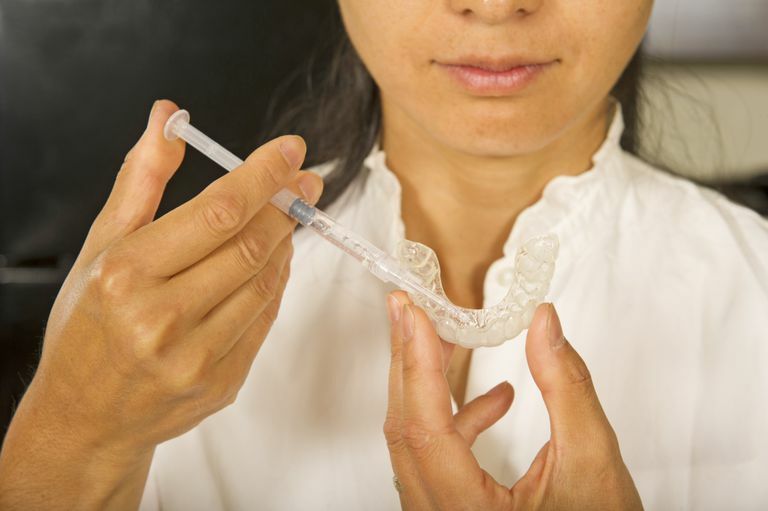 Custom-made trays (dental cups fitted to the contour of your teeth) must be manufactured in order to ensure the whitening solution are properly distributed. Without these, a lot of the solution could be wasted or put onto areas of the mouth that may be damaged. Impressions would first be taken of both your upper and lower teeth using non-toxic dental putty. These would be sent to a specialty lab to make the trays. This part of the process takes around one to two weeks from start to finish. In the meantime, the initial shade of your teeth would be recorded in your dental chart for comparison when the whitening is completed. When the trays are ready, an appointment would be set to show you how to properly dispense and apply the solution and other instructions needed to obtain the optimal results. After two weeks of treatment, a follow-up appointment would be made to track your results and see how they compare to your reference shade. The additional whitening solution can be used for touch-ups if needed. If do-it-yourself whitening is not your cup of tea, you can always opt for professional in-office whitening. It is a more expensive procedure but one that offers more reliable results. Besides cost, the one downside is that you would need to make multiple visits to the dentist's office. Before starting, your teeth would be polished to remove any plaque. Your mouth would then be isolated with gauze and a barrier placed along the gumline to protect it from the solution. Your teeth would then be coated with a whitening solution on the front surface only. Some whitening products require a curing light or laser to activate the peroxide. The solution would be left on for 30 to 60 minutes, or reapplied occasionally for up to one hour, depending on the brand.